WASHINGTON D.C. – Today a bipartisan group of Representatives including Paul Gosar (AZ-04), Don Beyer (VA-08), Martha McSally (AZ-02), Brad Schneider (IL-10), Tom Suozzi (NY-03) and Barbra Comstock (VA-10) introduced the Sarah Grace-Farley-Kluger Act. This legislation would add “death of a child” as a life event that would qualify for unpaid leave under the Family Medical Leave Act (FMLA), allowing a grieving parent up to 12 weeks to deal with the trauma and then return to work. 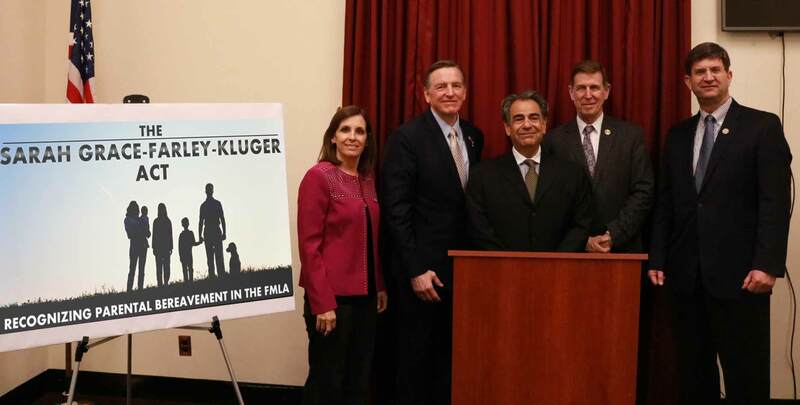 Today a bipartisan group of Representatives including Paul Gosar (AZ-04), Don Beyer (VA-08), Martha McSally (AZ-02), Brad Schneider (IL-10), Tom Suozzi (NY-03) and Barbra Comstock (VA-10) introduced the Sarah Grace-Farley-Kluger Act. This legislation would add “death of a child” as a life event that would qualify for unpaid leave under the Family Medical Leave Act (FMLA), allowing a grieving parent up to 12 weeks to deal with the trauma and then return to work. The full bill text of the Sarah Grace-Farley-Kluger Act can be found HERE. Currently, the FMLA mandates up to 12 weeks of unpaid leave for certain family events, including the birth of a child. During that 12 week period, an employer cannot terminate an employee who qualifies for such leave. This bill does not mandate any costs to employers or the government.